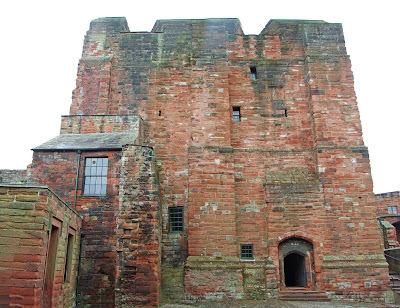 Carlisle Castle: A brief history. 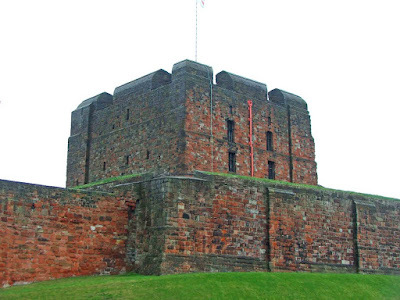 From the 12th century, to the Second World War, Carlisle Castle has been the centre of military defence and strength at the Northern border of England. The castle has undergone building, rebuilding, repairs, extensions and demolitions ever since its original inception, and at the same time has been bombarded, besieged, attacked, taken and re-taken so many times in its 900 year history. Above. A view of the South face of the castle. 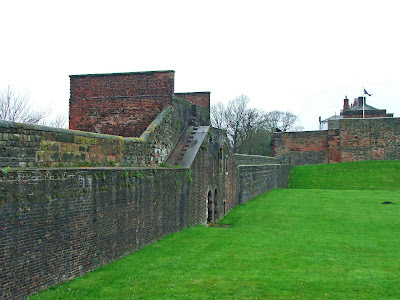 Carlisle Castle, old as it is, was not the first fortification in Carlisle. The Romans built and maintained a huge garrison from the 1st to the 4th centuries, and for these four hundred years of occupation, Luguvalium was a centre of military strength and civil habitation and trade. After the Romans left in the 5th century, the city that they built remained standing for many years, and the stone buildings and walls that they left behind were used in subsequent buildings and fortifications that the city and crown demanded. Above. The castle's keep behind the Southern wall. After the Norman invasion of 1066, the Scots continually harried the Northern towns, launching raids and invasions across the roughly cast Scottish-English border. Carlisle was the North Western frontline defence against these raids, and in the East, Newcastle served a similar purpose. In 1092, William II (also known as William Rufus) entered Carlisle, ejecting Dolfin of Northumbria and his garrison. He brought with him people from the south of England, to farm the lands and to populate the towns and villages. What ever castle that William Rufus built has long since been lost, most probably because it was no more than a wooden structure. 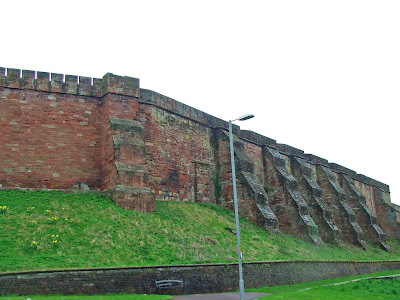 30 years later, in 1122, William’s brother, Henry I, invested in Carlisle’s defences, paying for a stone castle, towers and keep. Between 1122, and 1132, the city walls were completed, and building had begun on the castle’s enormous keep. However, David I of Scotland was responsible for the completion of this ambitious fortification project, and during his tenure of the city, the defences were brought to fruition. David must have recognised the importance of Carlisle as a border city, but his desire to have Carlisle on the Scottish side of the border only lasted until 1157, when his successor, Malcolm IV lost the city to Henry II. From this day forward, Carlisle has remained part of England. Above. The keep from within the inner ward. Henry II visited Carlisle on a number of occasions. The first time, in 1158, probably to check over his newly acquired Northern frontier city and its walls and castle. The second time was in 1163. Henry was responsible for the building of the castle’s curtain wall and the Southern gatehouse. The castle now had a double curtain wall, and was logically twice as impenetrable. Malcolm IV died in 1165 and was succeeded by William I (the Lion) Malcolm lead two sieges against the English garrison at Carlisle: in 1173, and in 1174. The siege of 1174 was the closest that the Scots got to re-taking Carlisle again, with Robert de Vaux holding out against the siege until late on into the year. The Scots gave up, and fled back across the border to Scotland, unaware how close the garrison had been to running out of food and water. Henry II again travelled North to Carlisle, this time in 1186. 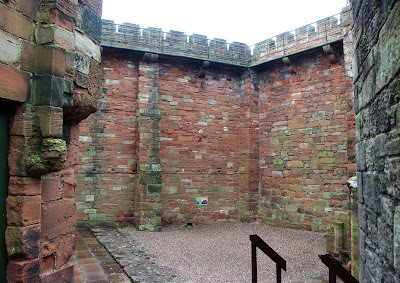 This time, Henry, probably with intentions to stay in Carlisle for some time, had personal chambers built within the castle. However, after his death in 1189, there was an absence of Royal visits, whilst his successor, Richard I, spent ten years away from the city, fighting in the Crusades. It wasn’t until the reign of John, that Carlisle paid host to the king again. 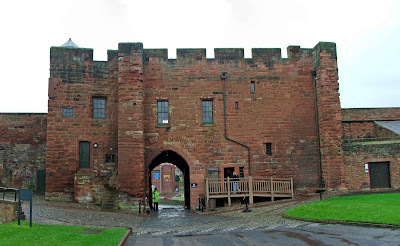 Unfortunately, his popularity was such that the citizens of Carlisle opened the gates to Scottish soldiers in 1216, and Alexander II led an assault against the staunchly Royalist castle. King John’s men managed to hold the castle, even after the Southern curtain wall was undermined and the inner gate house fell. The siege was soon successful, but such was the damage done by Alexander’s invading army, that Henry III was advised, in 1255, that the castle was sorely in need of repair and rebuilding. Above. 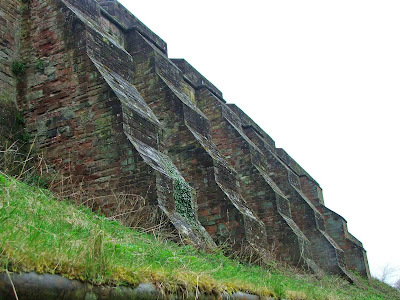 The huge buttresses on the outside of the North East curtain wall. From 1296, the opening year of the Wars of Independence, where Scotland attempted to shake itself loose from England’s grip, right through to 1346, Carlisle, much like the rest of the border regions, suffered at the hands of successive Scottish and English raids and invasions, and the general destruction that this period brought with it. The castle was repaired and strengthened, and its importance as a military stronghold grew, especially as the Scots marched South behind William Wallace to defeat the English at the battle of Stirling Bridge (1297) Edward I began to muster his army at Carlisle, in preparation for an invasion of Scotland. Whilst all this preparation and organisation went on, Edward held parliament in the city (1306 to 1307) During government’s stay in the city, the castle underwent some more changes, with a hall for Edward’s household, added to the range of buildings within the protective curtain wall. It was obviously intended that Edward would remain here for some time, whilst he attempted to bring Scotland to heal. Edward successfully led his army as far North as Elgin, taking Edinburgh on the way and bringing the Stone of Scone back with him. Above. Another view of the curtain wall buttresses. Edward II had further changed wrought on the castle, mainly making changes to the Royal apartments. These newly changed and rebuilt apartments were housed in a tower at the South East of the inner bailey of the castle precincts, with their very own systems of defences. Edward also had the castle’s ditches re-dug, widened and deepened. He had new, higher palisades erected, and the external and internal gatehouses were further fortified and repaired. He also had Springalds, giant crossbows that could be used to provide castle or city wall defence capabilities, installed on the keep and the Western wall postern\gatehouse. Above. View inside the Southern moat, looking East. After the defeat of Edward II’s army at Bannockburn, in June 1314, where a Scottish army of a mere 6000 men, managed to defeat a vastly superior English army of around 20000, Carlisle once again came under attack from the Scottish army, led by Robert the Bruce. With their new found confidence, the Scots laid siege to the castle in July 1315. They brought with them supplies including assault towers, to attack the walls, and all the tools necessary to undermine the outer curtain walls. However, the English garrison, numbering around 500 men, had the weather to thank for the failure of this siege. 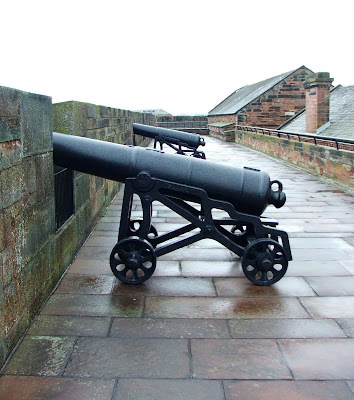 With almost constant rain, and floods appearing everywhere, the Scottish assault towers couldn’t be used, and tools for undermining the walls were useless. As well as this, the Scots probably lost large amounts of their supplies to the flooded rivers Caldew and Eden. Eleven days later, the Scots withdrew from Carlisle, leaving Andrew de Harcla, commander of the garrison, victor. Above. External view of the gatehouse. Edward II was deposed by his brother Edward III in 1327….and subsequently murdered. 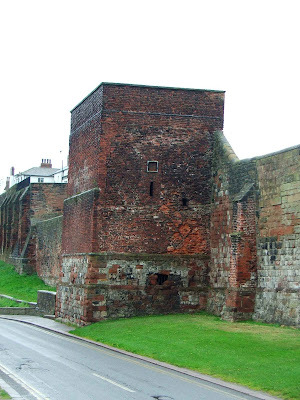 Edward III visited the city and its castle in 1335, and it was the last time he set foot in Carlisle. 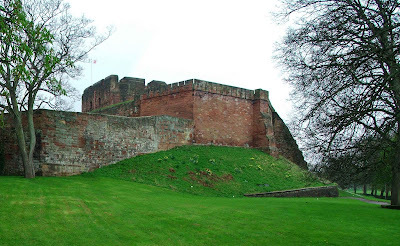 Royal interest lay on the European continent now, and as such, Carlisle ceased to become the important military frontier castle it had once been. Above. Internal view of the gatehouse. In 1378, it was ordered that the outer gatehouse should be rebuilt, and that the apartments and lodgings be made good. The castle had found a new use, and was to become the headquarters of the Warden of the Western Marches, and also to be the accommodation of the Sheriff of Cumberland. Above. View of the Tile Tower on the West curtain wall. The external gatehouse (sometimes referred to as de Ireby’s Tower) was redesigned, repaired and rebuilt by John Lewyn. His new designs for this imposing structure produced an impregnable squat gatehouse that blends in with the surrounding curtain wall. Above. The Tile Tower from within the city walls. The city, the castle and its walls received a large sum of money in 1430, which was used to arm the garrison, providing cannons and gunpowder. About this time, and to bring the castle and its defences up to date and into the age of cannon warfare, the Tile Tower was erected at the South West corner of the castle’s walls. Above. View of the upper floors of the keep showing the huge embrasures. This tower, built some time between 1452 and 1485, incorporated gun ports, and was designed to give the castle’s defenders a clear line of sight, to the West of the castle walls, to ward of any would be attackers. Above. Top of the North Eastern portion of curtain wall. Henry VIII continued this course of action, spending huge amounts of money on the updating of the city and the castle’s defences. With the rising tide of religious bickering throughout Europe, the two major faiths of the day, Protestantism and Catholicism represented threats to all and sundry. The North of England had been a hotbed of pro-Catholic\Papal support, and Henry saw that Carlisle was in desperate need of updating and re-arming, if it was to resist any sort of uprising, whether from English Papists, or from Scottish Papists backed by French or Spanish protagonists. It was decided that the castle could be upgraded to an artillery based defence with some rebuilding, and Henry employed Stefan von Haschenperg draw up designs for the work. The walls were essentially left as they were, but the castle and its curtain walls were altered to enable cannon to be placed upon them. Haschenperg altered the keep, taking away the medieval ramparts and replacing them with gun embrasures (where the inside of the embattlement is narrower than the outside) enabling the defenders to have wide angles through which to fire at would be attackers. Above. North Eastern curtain wall showing the cannon mounted there. He also widened the wall walks\ramparts at the top of the curtain wall, so that large cannon could be manoeuvred behind the battlements. Above. Interior of the armaments tunnel beneath the half moon battery. Lastly, he built the half-moon battery that lies just beneath the inner gatehouse. This large semi-circular structure was designed to provide the defenders with a last line of defence should an attacking force have made it through the outer gatehouse and into the outer bailey. Above. The half moon battery. The ditch in front of this structure would originally have been deeper and wider, and cannon would have been positioned within its confines. Anyone attempting to break through the inner gatehouse would therefore have to first get past this heavily fortified outwork. The castle’s armoury was bolstered with artillery captured at the battle of Solway Moss, when a tiny English force of around 3 thousand men, led by Sir Thomas Wharton (of Wharton Hall near Kirkby Stephen) defeated Scottish forces numbering some 15 to 18 thousand. Above. 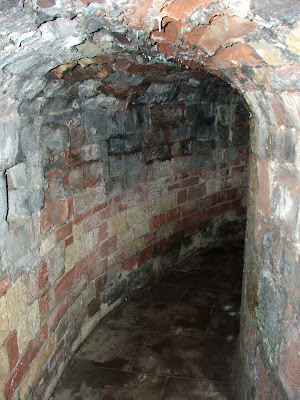 Interior view of the site of Queen Mary's Tower. In 1547 the castle’s magazine exploded, seriously damaging the castle’s keep. The damaged remained un-repaired for several years, and there was even talk of demolishing the keep. Above. Site of the original castle gatehouse. On the 18th of May, 1568, Carlisle Castle played host to its most famous guest….Mary Queen of Scots. After her small army was defeated at the battle of Langside on the 13th of May 1568, Mary, wearing disguise, crossed the River Solway and landed at Workington in Cumbria on the 16th of May. She spent a night hiding in Workington Hall, then owned by her good friend Lord Herries. However, the following day, she was arrested and escorted to Carlisle, where she was to spend the next two months in comfortable apartments, but none-the-less imprisoned. She was then transported on to more secure surroundings at Bolton Castle. Whilst at Carlisle, Mary was allowed to walk the castle walls, attend church and even walk with her retinue outside the castle walls. She also liked to watch her retinue play football in the fields beyond the confines of the castle. Mary’s apartments were situated in the South Eastern part of the castle’s inner court. Here, in a tower that was probably one of the most ancient parts of the castle, and most certainly the original Norman gatehouse, Mary lived in relative comfort. The tower was demolished in 1834 due to its poor state of repair, and all that now remains are some foundation blocks and the decorative remnants of a stair turret. Part of the surviving wall of Mary’s tower, is actually the original Norman gatehouse, and one single part still shows the grooves into which the portcullis would have been fitted. Towards the end of Elizabeth I’s reign, the condition of the castle was adjudged to have been weak. It was thought that it could only withstand an attack from an army simply armed with swords and shields. 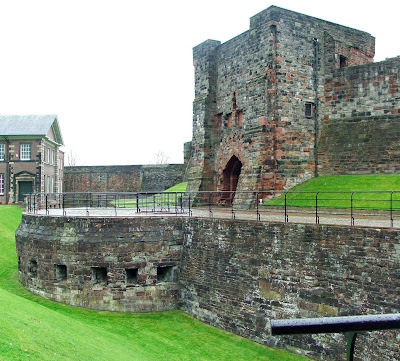 At Elizabeth’s death in 1603, Carlisle Castle’s use as a frontier fortress was in the balance. James I’s accession to the throne was greeted with bonfires and celebration at Carlisle. Those in the area obviously felt that a Scotsman on the throne of a united kingdom meant that the border regions would become peaceful at last. Unfortunately any peace that did appear was short lived, thanks to the vagaries of James’ successor, Charles I.
Charles mismanagement of the United Kingdom he had inherited from James brought about civil war, and once again, Carlisle became an essential military stronghold. The castle was re-fortified and essential repairs were made to the building’s fabric. New batteries were added to the South West and North West corners of the outer bailey, and additional guns were positioned on the Eastern side of the castle’s curtain wall. The re-fortifications were essential and timely, as in October 1644, a Scottish army besieged the castle, dug in, and prepared to wait for the castle to fall. The whole city endured the siege, melting down what precious metals they could lay their hands on in order to pay the defending troops. For eight months the siege continued, and it was only after Charles was defeated at the battle of Naseby, that all hope seemed to evaporate of Royal troops coming to the city’s aid. Charles’s supporters marched out of the city and the castle on the 28th of June 1645, and the besieging Scots entered as victors. The city’s new occupiers took stone from the cathedral, and used it to repair the battered city walls and the castle. They also built a new fort in Carlisle Market, constructing it with bastions and loop holes for small arms to be fired from. With a Parliamentarian victory, and the execution of Charles I, the Scottish occupiers were removed from Carlisle, and in turn, at the Restoration, the return of Charles II to his rightful place on the throne of a United Kingdom, the Parliamentarians were ousted, and the city was once again returned to the Crown. However, at the death of Charles II in 1685, his brother James II, a Roman Catholic convert from 1668 or 1689, ascended to the throne. His son, James, Prince of Wales (The Old Pretender) should legitimately have been his successor in turn, however, his father the king was deposed and sent into exile by a wary Protestant government. James II’s successors were the Dutch royals, crowned as William III and Mary II. The Glorious Revolution, as it is known, was essentially a bloodless coup, initiated by the government to preserver traditional English values and to oppose James II’s ideals of absolutism. James was exiled to France, and his son, the Old Pretender jumpstarted the Jacobite movement. Carlisle and the North Western border area was from this time forward, the main route that those backing the Jacobite cause would take to try and press their claim. The Jacobites first made their move on the 23rd of March 1708, launching an attempted invasion from the sea, with the aid of French ships, at the Firth of Forth. Their advance was blocked by the English navy. The Old Pretender’s main backers, the French were defeated, and it seemed that the threat to England and its throne was receding. However, in 1715, under the leadership of Charles Edward Stuart (Bonnie Prince Charlie or the Young Pretender) the Jacobite cause was once again re-ignited and on the 9th of November 1745, Prince Charlie’s army entered Cumberland with the sole aim of taking Carlisle. 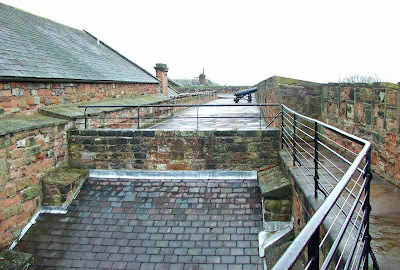 It seems that Carlisle really didn’t favour the young prince, but the garrison was in such a poor state of repair and readiness, that it was taken in a mere six days. The main reason behind this easy picking was that Marshal Wade’s army was away from the city, in Newcastle. With the city taken, Prince Charlie decided to leave and march his army South. In the event, he got as far as Derby, before being forced to return to Scotland due the apparent lack of support. 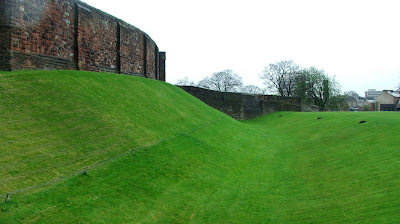 At Carlisle again, the Duke of Cumberland caught up with Prince Charlie’s retreating army, and they were forced to find refuge in Carlisle castle. On the 30th of December, after being bombarded for a short time, the Jacobite army surrendered. Prince Charlie had already fled England by this time, making his way eventually to France, where he spent most of the rest of his life. 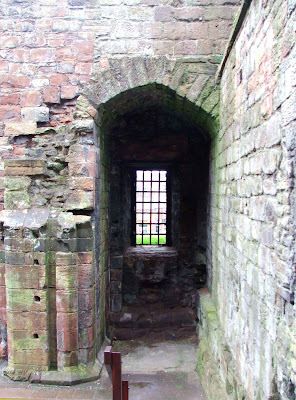 For those Jacobites caught and taken prisoner at Carlisle Castle, their fate was sealed. A number were hanged or imprisoned within the confines of the castle, whilst others were sent into permanent exile. A group of those imprisoned were subsequently hanged about a month later. The Jacobite cause was defeated, and the castle was handed over to the people of the city. 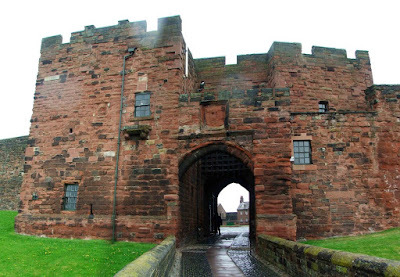 The castle became simply a backdrop to the city of Carlisle, with no serious threat or otherwise on the horizon. In 1819, soldiers once again actively returned to the castle in response to the growing call for a revolution in England (similar to that in France) and once again the city and castle were fully garrisoned. A period of rebuilding was committed, with buildings being erected in the outer bailey. The armoury was converted to the Arroyo barracks in 1827. A canteen was added in 1829, and called Gallipoli. A barracks was added in 1836, and called Ypres. A military prison was built in 1840. A court was added in 1841. 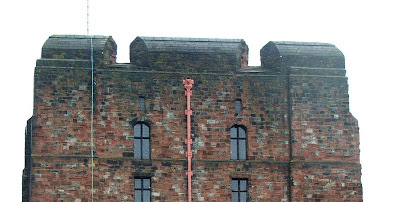 In 1872\73 Carlisle castle became the headquarters of the newly re-organised 34th and 55th Westmorland Regiments. The two bodies were then amalgamated in 1881, as the Border Regiment. In 1959, the castle became the headquarters of the newly created King’s Own Border Regiment, and today plays host to the Regimental museum. The last time the castle was armed, as a tool of war, defence or otherwise, was during the Second World War, when a machine gun was mounted on the summit of the castle keep.